Description: A cross pattee with a laurel border having a rose at the centre on each of the four flat ends. At the centre of the cross a British lion facing right. The scrolled top of the cross is fitted with an elaborate ring decorated with laurel leaves looped through a plain ring fitted to the suspender. The arms of the cross bear the names of the battles 'ORTHES', 'NIVE', 'TOULOUSE’ and 'NIVELLE'. The reverse and obverse are the same. 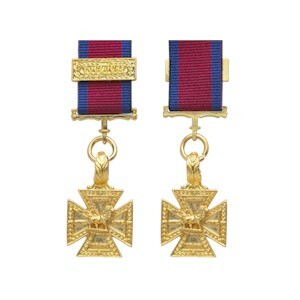 Comments: The most prestigious award in the campaign series, the army gold cross was approved by the Prince Regent in 1813. It was granted to generals and officers of field rank for service in four or more battles of the Peninsular War.